Travel can be an exciting, enriching experience, but getting from point A to point B sometimes is a hassle: sprinting through an unfamiliar airport or train station, navigating crowds while trying to find the right gate or track before missing a connection, and desperately scanning for signs to avoid getting lost. Without visuals to guide us in times like these, no one would get anywhere on time, making wayfinding signage in transportation invaluable. Types of wayfinding signage can vary, but there are a number of reasons that many transportation hubs are shifting to digital signage. In the past, static signage was used as wayfinding in transportation spaces. The changeable nature of modern transportation methods, however, means that static wayfinding signage can be quite useless. Digital signage, on the other hand, is easily updated, offers interactive experiences and can integrate real-time data. Its functionalities allow up-to-the-minute updates on news, weather, emergency alerts, location-based information, travel changes, and location-based advertising. Digital signage in the transportation space can reduce the time a passenger spends looking for a particular location. If the name or location of a site changes, instead of a facility needing to swap out a static sign or print new maps, the updated information is uploaded to a server, and the digital signage reflects it immediately. Another benefit of digital signage in transportation is the use of both national and location-based advertising. Digital signage systems’ naturally dynamic capabilities are able to showcase advertising that is meaningful and impactful to the intended audience. Further, its flexibilities allow it to incorporate a brand’s colors and logo easily, employ compelling visuals, and interact with user technologies like mobile phones; this smarter advertising creates better engagement and leads to more sales. There are a number of ways digital signage can be implemented in the transportation sector. Static digital signage is an entry-level point to wayfinding and generally would be more useful in a smaller facility than in a large international airport or massive transit terminal. Although it is beneficial in some respects, a static solution showing a digital map of the facility is not maximizing the dynamic capabilities of real-time information and data. Kiosks have been used for digital wayfinding purposes for quite some time, but their applications are becoming more intelligent. While kiosk touchscreens allow users to search for a specific outlet within an airport or bus/train terminal and obtain directions, or just browse what’s in the area, many are utilizing analytics to better understand the users and their interests to help drive new, effective content and advertising. Video walls also are found in wayfinding applications. The configurations generally aren’t in traditional two-by-two or three-by-three layouts; they might be two by two, but in portrait form, or they might be two screens in portrait side by side, where users can touch one screen for wayfinding and the other displays digital advertisements. When a transportation hub is looking to implement digital signage into a space, there are four key planning items to think about. The first is to determine what the goals are. These could be simply to get travelers from point to point, or they could be more involved: increase awareness of the facility’s offerings, show announcements or alerts, or boost sales through advertising. Once goals are defined, the next step is determining what kind of digital signage to deploy. A transportation facility that just wants a digital map might only need a 42- or 46-inch display, while incorporating advertising or an announcement board may require something larger—a 65- or 70-inch display. After that, it’s important to determine how an organization expects to benefit from what they deploy—to be able to measure the goals that were set. There should be a way to track user satisfaction or increased sales due to the digital signage implemented. Lastly, it’s important to think about the future: what additional resources or add-ons can be integrated into a digital signage strategy beyond simply wayfinding and touchscreens. Digital wayfinding signage has applications beyond moving travelers along. DOOH advertising is the most obvious add-on to a wayfinding strategy. 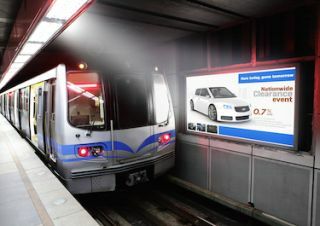 It’s often seen as less disruptive than traditional advertising; travelers expect to see it while waiting for transportation, and it can be viewed as more helpful and timely than in-home advertising by showing information about places to eat or shop within a terminal, as well as local attractions and services like Wi-Fi or cellphone service carriers. Static digital signage for wayfinding coupled with advertisements allows a more constructive use of the digital displays, and content can be updated frequently without changing out the display itself. Larger LED video walls can also be integrated with mobile technologies and ads so that users can make a purchase or get more information. Adding beacons, near-field communication (NFC) or RFID chip technology to kiosks or digital displays is another option. A user can tap a smartphone to a display or kiosk with NFC technology or use a QR code to receive transit or product information directly to a device. Beacons are a fast-growing technology in many sectors; Business Insider estimates that there will be 4.5 million active beacons by the end of 2018. There are many apps for air, train or bus travel, and beacons can pick up that a traveler’s mobile phone has the app and target market them on digital displays, or beam ads or promotions directly to a smart device (the caveat here is that a traveler must opt in to receive these). A kiosk can become a Wi-Fi hub as well as a wayfinding mechanism to make it more multipurpose. Travelers waiting in terminals can connect to the Wi-Fi embedded in the kiosk, which opens up opportunities for increased revenue through Wi-Fi fees, as well as targeted advertising. Wayfinding in the transportation space is about much more than a sign pointing the way. Using digital signage to engage and interact with travelers can create a smoother traveling experience while also boosting revenue, and is a part of the movement toward smarter cities – a web of data and information constantly being collected and transmitted to link people and technology, creating a truly connected, informed world. For more information on digital wayfinding signage in transportation, check out this industry roundtable at the 2016 Digital Signage Expo. You can register for DSE and the roundtable here. Richard Ventura is Vice President of Business Development and Solutions for NEC Display Solutions (www.necdisplay.com). He can be reached at rventura@necdisplay.com.